Have you ever been to a sporting event? Have you ever seen the above poster there? It’s an easy way to share the word. So after worship service, Madison took the word to the sidewalk, with her mom, to the front of the church. She was happy to share the word. 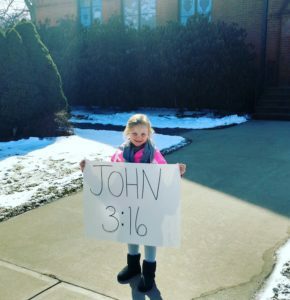 We are proud of her efforts to share the word. Will you share the word too? An annual tradition here at the YUMC, we begin Super Bowl Sunday with a time of fellowship and, like all good Methodists, food. After our Morning Worship, we gathered in the Social Hall for a variety of homemade soups and a wonderful salad bar. Dessert and coffee as always followed, if you had room in your tummy! Christmas 2016 was fun and quite the Celebration! We enjoyed Candy Canes as you can see the kids above. Delivered with a poem, referencing the cane like a shepherd’s crook, the white like the Holy Spirit, the red like the blood Christ shed for you. Thank you to Jim Jackson for the donation of the Candy Canes. Everyone participated in the telling of the birth of our Lord and Savior. See the 3 Kings, the Angels, Mary, Joseph and the sheep in the manager. Hymns were sung to praise the good news. On Saturday, December 10, the Connecticut Yankee Chorus entertained our church, family, friends and neighbors. The men were amazing singing a variety of tunes throughout the years as well as Christmas hymns. A history and demonstration of how Barbershop is an unique style of music, “made” in America. Very interesting. Thank you Gentleman for this wonderful show!